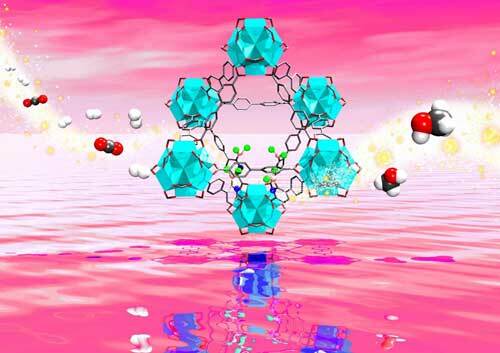 (Nanowerk News) Research at the University of Pittsburgh's Swanson School of Engineering focused on developing a new catalyst that would lead to large-scale implementation of capture and conversion of carbon dioxide (CO2) was recently published in the Royal Society of Chemistry journal Catalysis Science & Technology. Principal investigator is Karl Johnson, the William Kepler Whiteford Professor in the Swanson School's Department of Chemical & Petroleum Engineering. Postdoctoral associate Jingyun Ye is lead author. The article is featured on the cover of Catalysis Science & Technology ("Catalytic Hydrogenation of CO2 to Methanol in a Lewis Pair Functionalized MOF") and builds upon Dr. Johnson's previous research that identified the two main factors for determining the optimal catalyst for turning atmospheric CO2 into liquid fuel. The research was conducted using computational resources at the University's Center for Simulation and Modeling. Karl Johnson CST cover image"Capture and conversion of CO2 to methanol has the potential to solve two problems at once - reducing net carbon dioxide emissions while generating cleaner fuels," Dr. Johnson explained. "Currently, however, it is a complex and expensive process that is not economically feasible. Because of this, we wanted to simplify the catalytic process as much as possible to create a sustainable and cost-effective method for converting CO2 to fuel - essentially to reduce the number of steps involved from several to one." Johnson and Ye focused on computationally designing a catalyst capable of producing methanol from CO2 and H2 utilizing metal organic frameworks (MOFs), which potentially provide pathway for a single-process unit for carbon capture and conversion. The MOFs could dramatically reduce the cost of carbon capture and conversion, bringing the potential of CO2 as a viable feedstock for fuels closer to reality. "Methanol synthesis has been extensively studied because methanol can work in existing systems such as engines and fuel cells, and can be easily transported and stored. Methanol is also a starting point for producing many other useful chemicals," Dr. Johnson said. "This new MOF catalyst could provide the key to close the carbon loop and generate fuel from CO2, analogously to how a plant converts carbon dioxide to hydrocarbons."